The fourth largest city in Kerala, Thrissur (Trichur) has emerged as one of India’s most popular tourist destinations, and it's not hard to see why. With a stunning diversity of architecture, numerous museums, art galleries and places of interest, and extravagant dance and music festivals such as its Pooram festival, the place has a wealth of culture. Visiting Thrissur, called the cultural capital of Kerala, is like entering a living museum. The city is home to several influential art institutions such as the Kerala Sahitya Academy, Kerala Sangeetha Nataka Academy and the Kerala Kala Mandalam. Dedicated to Lord Shiva, the Vadakkumnathan temple is the most famous shrine of Thrissur, Thiruvambadi, Paramekkavu temple and the Guruvayur temple are the other shrines of Thrissur. 3 km north of Guruvayur Sreekrishna Temple is Punnathur Kotta, the Guruvayur Devaswom’s elephant sanctuary where elephants offered by the devotees are housed. Visitors can visit the sanctuary to watch these elephants. Located in the Thrissur district of Kerala, Guruvayur (also spelt Guruvayoor) is one of the most sacred and famous pilgrimage sites of India. Its spiritual heart is the temple dedicated to Lord Krishna (Guruvayoorappan). During the months of February or March, the famous annual Ulsavam Festival is marked by splendid elephant races (anayottam) and processions. The best elephants take part in the competition, an important part of the ten day festival. Guruvayur is 29 km away from Thrissur. 63 Km from Thrissur, this 24-metre (80 ft) waterfall at the threshold of the Sholayar ranges joins the the Chalakudy river in an incredible landscape. 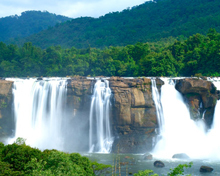 The picturesque Vazhachal waterfall is a short drive from the Athirappilly Falls which is located 70 km away from Kochi city and 30 km from Chalakudy. Located in the heart of Thrissur near the famous Vadakkumnathan Temple, the centuries old Shakthan Thampuran Palace is a major landmark of Kerala. 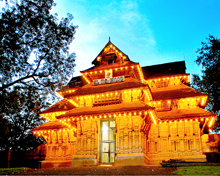 Also called Vadakkekara Palace, the palace also contains a museum which houses ancient artifacts. Sakthan Palace is preserved by the Archaeological Department. Chavakkad Beach in the Thrissur district is ideal for those beach goers for whom a day at the beach should be peaceful and relaxing to the soothing sound of the Arabain sea and gentle swaying of the coconut trees. The beach is 5 Kilometers from Sri Krishna Temple of Guruvayur. One of the most famous temple festivals in the state of Kereala, Pooram festival is celebrated in the Malayalam month of Medom (April/May). 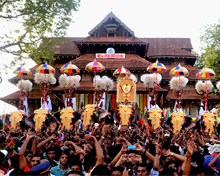 The festival, which is a culmination of the eight-day Utsavam of nine temples, was started by Sakthan Thampuran, the ruler of the erstwhile princely state of Kochi. Cultural programmes where artistes far and wide give their performances make this a lively event. The amazing procession from Devi temple and Krishna temple is carried out and presents an amazing experience. Added to this, the huge procession of caparisoned elephants is worth watching. The best elephants of Kerala belonging to different temples in the state participate in the Pooram festival. Amazing spectacle of fireworks is an added attraction which keeps the visitors thrilled. Air: Nedumbassery Airport near Kochi is the nearest airport which is 80 Km away from Thrissur. The Kochi airport is one of India's best. Regular flights connect Thrissur with major cities in India. International flights the airport with the Middle East, Sri Lanka and Singapore. Rail: The railhead at Thrissur is connected by rail with major cities and places in India. Road: Thrissur is well connected by road with different cities and places in South India. Some of the cities, towns and places in South India connected with Thrissur are Kollam (229 km), Alappuzha (143 km), Munnar (158 km), kottayam (138 km) and Tiruchirappalli (316 Km). A wide variety of hotels are available in Thrissur to meet the needs of the tourists. Whether one is traveling for pleasure or business, Thrissur has a wide array of accommodation options to choose from to suit all budgets. Joys palace Hotel, Hotel Luciya Palace, Pooram International, Hotel Niya Regnecy, Wariyam heritage, Mayura Inn and Sankers Home are some of the famous hotels in Thrissur, Visitors are advised to book in advance during the peak season. Accommodation in Thrissur is very easy to acquire as the city is filled up with lots of resorts and hotels catering to the needs of everyone.